Costa Rica is one of the most exotic places in Central America and thus a favorite spot for adventure lovers. It is also known for great food and breathtaking landscapes. Café Liberia is known for its incredible quality when it comes to food. The restaurant serves a wide variety of cuisines, thanks to the excellent chefs. the food array includes Costa Rican, Latin, café, Central American, fusion, vegan, vegetarian and gluten-free meals. All these meals are served fresh and attractively. You can never be disappointed because the food is delicious and drinks are also wonderful. Though the menu may be limited, one sure thing is that there is always something for everyone. The restaurant has a very conducive ambiance for people on leisure. For those who like takeaway snacks and drinks, This is the place. There is plenty of sitting space both inside and outside the restaurant. the restaurant occasionally hosts live music in the courtyard. Reservations can be done. The service offered by the staff is also very warm and kind. They go out of their way to ensure that the customers are excellently served to their satisfaction. The prices are reasonable for all services and meals. There is a free Wi-Fi connection which makes it a suitable spot for holding business meetings. It is ideal destination for romantic getaways, large group activities, parties and favorable for families with children. There is a bar available that serves you with the best drinks of your chocie. Café Liberia accepts cash payments as well as master card, visa, and American Express. The restaurant is located in Liberia, the province of Guanacaste in costa rica. Restaurante Tierra Mar is a nice place to be. The kitchen is located at the back of the restaurant which is open and clean. It gives you confident in the foods being cooked in the kitchen because one can see its high level of cleanliness. If you want to spice up your visit, order different meals any time you plan you plan for eat out. The owner, who is a chef, understands the value of having welcoming and delicious foods. The chef interacts with customers which makes the visit feel like home. There are different cuisines available like Costa Rican, Seafood, vegetarian friendly, Central American and Peruvian. There are also gluten free food options. These foods are delicious and uniquely prepared especially the sea foods can never disappoint you. The variety of foods caters for different choices in people. It is good to visit restaurants with a variety of options because it will give you freedom to choose. It is a suitable place to have a family diner. Vegetables, homemade sauces and fresh fish are so delicious. They have a variety of local foods at an affordable price. The environment is clean with a free flow of fresh air. It helps you to relax and enjoy the ambiance of the restaurant and you enjoy your meals. The staff members are welcoming and friendly. They ensure you get what you order and get satisfied. They are always willing to help you choose the best meal from the menu. Restaurante Tierra Mar is a wonderful local gem which is located at the heart of Liberia, Costa Rica. It is easily accessible with perfectly crafted local foods. 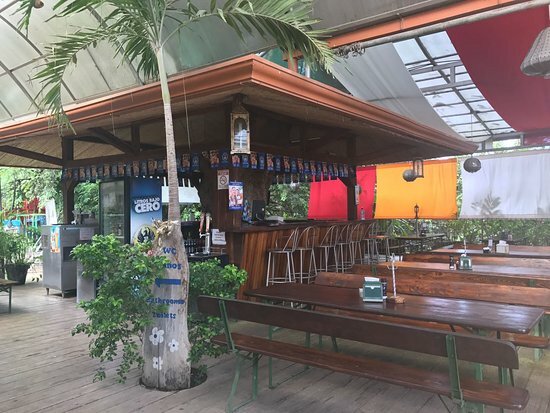 Whenever you are planning to visit Costa Rica, include this restaurant in your list. You will fall in love with different cultural cuisines. This place is the best to with family and friends. The waiters are welcoming and attention to details. It has a great environment with cool music always playing at the background. The environment is well maintained clean. It has unique cocktails and wine choices. The cocktail juices are made with local fruits to enhance their taste and to give you the best experience. It is a five star restaurant and you will love the experience anytime you visit Liberia Social Club. The foods and drinks are great. The menu has a variety food options and you can always try something new every time you visit this restaurant. They have delicious and well cooked fish tacos that I would want to eat again once I go back to Costa Rica. The food prices are affordable and you will receive quality food and services. The waters are also friendly; they will guide you through the menu to help you order for what you prefer. It has a unique dining lounge that is spacious enough to accommodate a family dinner. It has awesome lighting, table décor, artwork and musical. A combination of these things gives the restaurant a relaxing ambiance. The atmosphere is relaxing and suitable for evening diners and you can choose different locations to sit. It is strategically located with direct roads and you can never miss this spot. It is one of the best restaurants in Costa Rica and in Liberia. You will need extra time when you visit this restaurant because the environment is exciting and attractive. With the exceptional lighting, you will love the experience and relax more. It is the best place in the region for relaxing and having a good time with family and friends. I have visited this place with a large group of friends and everyone loved Marisqueria Sabor Porteno’s food. I highly recommend you to visit this place any time you are in Guanacaste. You will definitely enjoy the food and come back. The owner is a chef who really knows what needs to be done to make food delicious and to make the restaurant environment welcoming and comfortable. The restaurant is extremely clean and the waiter’s services are good. It has no AC but it is cool since the restaurant is spacious. The waiters are friendly and keen to details. The price for food is affordable and would highly recommend Marisqueria Sabor Porteno restaurant. The food served in this restaurant is delicious especially grilled octopus and shrimp. The chefs understand their work and always giving their best when it comes to sea food as well other delicacies. The most interesting thing with this restaurant is that they have a TV that shows how your meal is being prepared and you can watch other meals as well. It is strategically located in Guanacaste and the area is spacious. It has a bar and wine services which are suitable for romantic diner or eat out with friends and family. You will be able to view how your food is being prepared by the highly trained chefs. You will enjoy your food right from the preparation to eating time. It is located of the old Governorate 400m South and 100m East and 25m South in Costa Rica. It is a perfect destination for anyone who visits Costa Rica. It has direct roads in and out of this restaurant. If you want to enjoy the best of seafood, make a visit to the Marisqueria Sabor Porteno Restaurant.